The Sensible BC petition is entering its final month with less than half the signatures it needs to force a referendum on decriminalizing marijuana, and its lead organizer admits the effort may not succeed. Dana Larsen couldn't say precisely how many signatures the petition has collected, but he said it was in the "low 100,000 area" -- well short of the roughly 400,000 names it needs by Dec. 9, the deadline to submit the petition to Elections BC. "We're bringing in more signatures every week than the week before," he told The Huffington Post B.C. "We need to have that continue in an exponential fashion over the next four weeks." The petition aims to force a vote on the Sensible Policing Act, which would direct B.C. police forces to stop enforcing marijuana possession laws. The compressed time period has campaigners seeking out new ways to collect signatures. Canvassers are shifting away from taking names in public places because campaigners have tapped out many of the locations where they've been stationed in past weeks. "You can only be at Metrotown SkyTrain Station for so many days or weeks in a row before you start seeing the same people over and over again," Larsen said. Bill Vander Zalm, who led the successful Fight HST campaign, has been a proponent of public canavassing. But Sensible BC canvassers have started going door-to-door and calling supporters, reminding them that they only have one month left to sign. As the campaign reaches its end, Larsen said a number of factors have hampered Sensible BC's efforts. One of them is B.C. 's referendum system, which makes it very difficult for any initiative to succeed. Campaigners must collect 10 per cent of eligible voters' signatures in every provincial riding to force a referendum. Initiatives fail if even one out of 85 districts doesn't meet that threshold. "Our referendum system is designed to fail, and we knew that going into it," Larsen said. "I'm not trying to make excuses, but it is clear that the referendum system in B.C. is extremely challenging." Kash Heed, a former B.C. 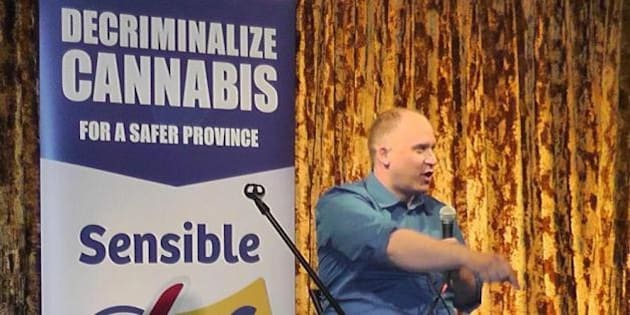 attorney-general and member of Stop the Violence B.C., a pro-legalization group, said that Sensible BC would have been better served by campaigning for regulation and taxation of marijuana, rather than decriminalization, which simply calls for police not to enforce certain drug laws. "The decriminalization approach, which Dana and his group have been pushing, it only reaches out to a certain element," he said. "Trying to make it part of legislation, I think the people in B.C. realized that wasn't going to work." If the campaign fails, Larsen said he might try the initiative again next year, though he admits that financing would be more difficult. Terrace lottery winner Bob Erb has donated at least $200,000 to Sensible BC and he says it's unlikely he would contribute that much cash again. But he said a second campaign could be cheaper because they already have many of the materials they would need. Larsen, however, is looking on the bright side. "Ultimately we've created a huge organization, the largest marijuana reform organization ever in Canadian history, and I think that organization is going to serve us very well in the future," he said.